Happy Home Baking: Here Comes Santa Claus! My two boys have been waiting for this day ever since the school holidays started. During the past weeks, they kept changing their minds about what to wish for from dear Santa. After much deliberations, both of them finally made their final decisions, and wrote their wishes to Santa, just last week! In the past, they would constantly pester me with questions on how Santa can come into our house since we don't have a chimney! I always tell them my standard answer..."he will find some ways to get in, so don't worry!" It was only after reading a book about St Nicks, both of them agreed that the old man will shrink into the size of an ant, and crawl into our house by the key hole ;p Last nite, they were still talking about installing a few hidden video cameras, and setting up some infra red security systems at the various corners of the living room so as to catch Santa in action! Just before bedtime, they have wanted to prepare some cookies and a cup of hot coffee for Santa...but mummy was simply too tired to get it ready, and told them Santa would have his fair share of cookies and drinks from all his rounds. 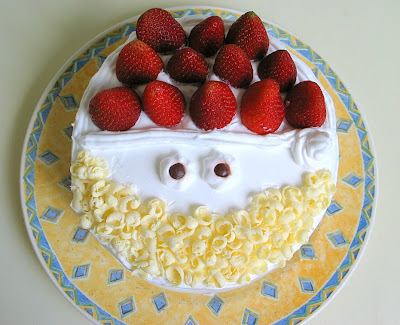 I made this Santa Claus cake as dessert for our xmas eve dinner last nite. Don't ever think that I am creative enough to come up with this on my own!! I have copied the entire idea from this Japanese Meiji website here. It even came with a demo video to show you how to make and decorate the cake. I can't read a single Japanese word, but the video is really self explanatory. I didn't follow the sponge cake recipe given in the website though. I used one which I copied from a Japanese to Chinese translated cookbook. This recipe is for an 18cm (7") cake, which is just the idea size for our family. Making the sponge layer was relatively easy. I filled the middle with some non-dairy whipping cream and some strawberries slices. I also thought that frosting the exterior with cream was not too difficult this time. The only problem I faced was making the chocolate curls for the beard. In order to get very nice curls, first, the chocolate must be at the right temperature (room temperature)...soft enough for it to curl when you scrap it. Second, you got to use the right tool. I tried using a normal small spoon, it didn't curl up but broke into tiny bits instead...then I tried using a peeler...the curls was way too long! Then I realised the right tool should be a small ice cream scoop. Since I don't have one, I looked around my drawer to find something suitable. It was a plastic spoon (the 2.5ml end) which is use for dispensing medicine for my kids that did the trick! The cake tasted very delicious...light and refreshing. The texture of the sponge layer was very soft and moist! I think it has got to do with brushing the sponger layer with sugar syrup. The cake was not dry at all even though I made it one day ahead. There is no doubt that this sponge cake recipe is going to be a keeper! Sift cake flour, set aside. Line bottom and sides of an 18cm (7 inch) round pan with parchment paper, set aside. Pre-heat oven to 170degC. Position rack at the lower bottom of the oven. With an electric mixer, whisk eggs and sugar on HIGH speed for about 5 to 7 mins, until the batter double in volume and is ribbon-like (the batter should leave a ribbon-like texture when the beater is lifted up). Turn to LOW speed and whisk for another 1 to 2 mins. Whisking at low speed helps to stabilise the air bubbles in the batter. Add in fresh milk, vanilla extract and fold in gently with spatula. Pour the batter into the pan and bake for 30~35 mins, or until a skewer inserted in the centre comes out clean. Unmold and invert onto cooling rack, cool completely. Your sponge cake looks delicious! Lol i used to wonder how Santa would get into my home since i don't have a chimney too. But my parents were rather straightforward, they immediately told me that Santa doesn't exist. Aimei, let me know after you tried this recipe. I think in order not to get a very dry cake, the baking time is quite critical. You got to get the cake out when it is just done, so don't overbake. Hi Ece, thanks for being a regular visitor of my blog. Although I don't understand Turkish, but your blog is lovely, especially the banner...is it be a drawing done by your child? Hi Sweet-tooth, we like the cake very much...my husband couldn't help but keep reaching out for another slice! Oh, my elder boy's friends do not believe in Santa...bet he's the only one who believes in him :) He told me when he grows up he wants to visit Santa in Finland, I told him he must buy a ticket for me to go with him too!! The Santa is so cute. Hi SP, I used non-dairy whipping cream for the frosting...you just need to pour and whip. Hope this helps. Hi happyhomebaker, you mentioned about brushing the cake with a sugar syrup.Can you please help elaborate further on this? What was needed to make the sugar syrup and when did you brush it? after the cake has cooled and how long before frosting the cake? 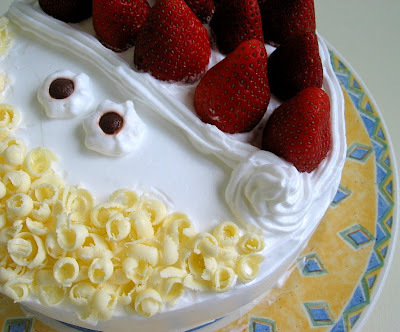 I would love to bake this for my daughter's birthday which is this Sat. Thank you very much! I'll be making a no-bake birthday cake for my husband...his bday is this Sat too. Happy Birthday to your girl!! Have tried your muffin receipes and they were great! But I tried the receipe for the Santa claus sponge cake and found that my cake did not rise. Do you think its cos i didnt beat the eggs and sugar enough??? I tend to think that it's due to the beating of the eggs...did u beat till it double/triple in volume? and when u lift up the beater did the egg mixture left a ribbon like trail? Hi Anonymous, I am not sure what you meant by 'rough'...was it dry and coarse? I am not too sure what went wrong...but if u managed to get the batter right, then it would likely due to the baking temperature and baking time. Did you preheat your oven (at least for 15-20mins?) Baking at too low a temperature will tend to dry out the cake...and too long a baking time, will make the cake dry too. You can refer to this site (http://www.baking911.com/cakes/problems.htm#WHAT) for possible causes. Hope this helps. Hi Anonymous, yes I do have the same problem...scrapping off the crumbs while trying to frost it! I have not attended any baking class, and dont really know how to go about decorating a cake. What I have learn from books is...u can spread a thin layer of cream on the cake...then chill it before spreading on the rest of the cream. This way, the crumbs will not get into the way. Hope this helps. glad to hear that u managed to bit the batter till it double in size. Now you may need to practice a little more on the folding in of the flour. Non-dairy cream has sugar added in, so it is not necessary to add in sugar when whipping, and the colour is almost pure white. whereas for dairy cream, it is usually off-white...a little yellowish. You will have to add in sugar when u whip dairy cream as it has no sugar in it. I looking forward to hearing great news from u again! Hi Lizzy, I used the Redman brand's non-dairy whipping cream available at Phoon Huat. can i know why u choose to use whipped cream? can i buy those ready made whpped cream in a spray can? how much whipped cream can the whipping cream produce? Hi Anonymous, I have never thot of using those whipped cream in a can. I am not sure whether it is suitable? thks for anwering my qns. if i use redman's whipping cream, do i whipped the whole pack? how do i store the unused cream. Hi Anonymous, I usually whip about 1-1.5 cups of cream to frost a 18-20cm cake. You can store the unused cream in containers in the fridge. You may ask the sales staff at Phoon Huat for advice on storing too. wow, your sponge cake looks great! I would love to try it someday but have a question to ask, I only have a 20cm (8inch) round cake tin. but notice your recipe is for a slightly smaller cake. i think i have to change the qty of the ingredients used in order to fit my cake tin..can u kindly advise what should be the amt of each ingredient i should use? thks for directing me to that site. i was about to ask u about subsituting the salad oil with olive oil. You said it can be done but i am wondering, will using olive oil give a funny taste because i read somewhere that using olive oil may have that effect. btw, i juz checked out the website with the photo effects, it is really cool! thks for posting...and finally, you have a wonderful hubby and a v thoughtful son! I have tried using Pure olive oil (not extra-virgin), but I couldn't taste any difference...I guess my palette is not that well trained ;) In that case do stick to what is recommended in the recipe. I've just tried out this recipe of yours and it is wonderful! Thank you so much for posting it. It's truly a light and tasty cake. And now I can make it! You rock! I recently used your sponge recipe to make a chestnut layered cake and it was just PERFECT. very soft and moist. thankyou so much for sharing :) much appreciated. 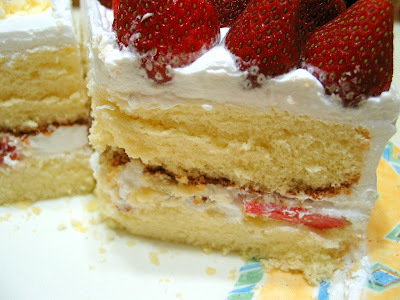 And for the sponge fingers used in the strawberry mango cake, where can i get it? For whipped cream, it can be easily get in NTUC, Sheng Shiong? Hi FAN, yes, you can use salted butter. I bought the sponge fingers from Carrefour, you may be able to find it at certain NTUC outlets. For the non-dairy whipped cream I bought it from Phoon Huat, you may also find it at Carrefour, cold storage. I am not too sure about NTUC though. hihi, ur pictures & recipes are really inspiring. Gonna try the Santa cake for this Xmas. BTW, i tried making the Otah Bread, but i used hotdog instead. The taste is there, however i wasn't able to achieve the RIGHT texture like urs. It was dry inside. & my bread was ready in abt 8 mins. With the top part golden brown already. Maybe i'll hv to drop my oven temp to 170degrees. Any suggestions? Hi ta-B, besides lowering the oven temperature, you may also try baking the buns at a lower rack position. HI there, I was wondering, if I use dairy whipping cream would I get the same result as the non-dairy whipping cream? Hi Anonymous, you may use dairy whipping cream...the only thing is, the colour may not be pure white...as I've noticed that dairy cream has got a yellowish tint to it. I was trying to follow your recipe but just as I put the cake in the oven I realized that in the recipe you didn't add in the vanilla extract; do I need this? And if so, when should I add it into the batter? Btw, I tried your chicken and mushroom baked rice recipe and it turned out delicious! Hi Chika, I'm so sorry for the error! I have updated the recipe, you will need to add the vanilla extract with the fresh milk. Did you add in the vanilla? If not, I think it wouldn't really affect the cake too much. Once again my apologies for the mistake! I'm glad t hear that your baked rice turned out well :) I have comments that some readers who tried the dish, find it too bland? I need your help!! I can't seem to bring the volume to double.. I tried twice and achieve the ribbon effect but never succeeded in the volume. I followed your instructions and even watched the Jap video. What do I need to do to bring it up to double vol? Hi Angie, I am not sure what exactly was the problem...but since you are able to achieve the ribbon effect, the egg mixture should double in volume by then. Did the egg mixture turn pale, thick and creamy when it reaches the ribbon like stage? If yes, you are on the right track...and how was the texture of the finished cake? Hi, thanks for the reply. The mixture turns creamy and thick but it does not double in volume.. The finished cake did not rise and was tough. Not spongy at all. Visit http://www.youtube.com/watch?v=M-PIkE3m3ms. Although the narrator mentions doubling in volume during the mix, hers does not show that effect. That's my problem as well..
Hi Angie, did you separate the yolks from the whites? For the video which you have provided the link, the sponge cake is made by beating the egg yolks and whites separately. Whereas for my recipe, it is made by beating whole eggs (both yolks and whites together). So if you beat only the yolks, it will not double in volume. Hi Cheryl, I think you didnt fold in the flour properly. You can take a look at the demo on how to go about folding in the flour. To prevent those tiny lumps, you can sieve the flour 2 to 3 times before using. Then add in the flour (sieve the flour into your mixing bowl) to the egg mixture in 3 separate additions, folding in the flour with a spatula each time. btw, did you beat the egg mixture till it becomes pale, thick and leave a ribbon-like trail when you lift up the paddle. Hope this helps. I baked this sponge cake yday and I must say it's good enough for me. However, I may have underbaked the cake as the top is slightly sticky when the cake is cooled. But overall, it's good except that it's abit too sweet for us. Will reduce sugar slightly next time I bake this. Thanks for sharing! 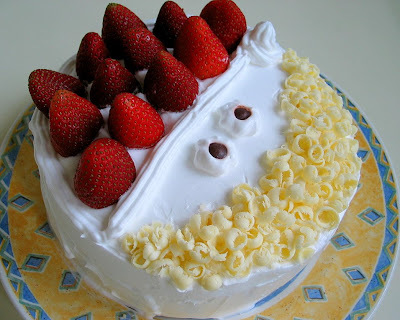 I want to try the cake for my 2yrs old daugther's birthday. Can I check with U, for your whipping cream ? Hi Reena, try not to reduce the sugar too much, as there is no leavening used, the sugar helps to create the volume when you beat the eggs with sugar. Hi Anonymous, yes, I use Redman non dairy whipping cream...you just need to whisk it, make sure the whipping cream is chilled when you start. You will need about 1-1.5 cups. Pour it into a mixing bowl, and beat with an electric mixer. It will only take about 2-3 mins or so to turn to soft peak (on medium speed), continue to beat for a couple of more mins to get to stiff peak, it will be easier to use for frosting and piping. Hope this helps. Happy Birthday to your girl!!! I will try it this saturday... Hopefully success. I made this again but reduced sugar to 60g and baked for an extra 5 mins. The cake turned up almost perfect! Thanks for sharing this great recipe! Definitely a keeper! BTW, I've just created my own blog, may I link you please? Hi Reena, welcome to the blogging world :) and it will be an honour to have you link me up! hii.. i wanna know what's cake flour and where to get it?!?! thanksssss ... awesome yummy blog ! Hi, I've been wanting to get a new sponge recipe. All these while, I've been mostly using chiffon as my base for layered cakes. They are light and fluffy but I'm wanting to get a recipe which is a little less fluffy and a little more moist. I'm not sure if I make sense! Anyway, I've been looking through your site and noticed you've been consistently using another sponge recipe (the 4 eggs one) and then now this one above. Was wondering how would you compare the two sponge recipes? Appreciate your feedback. Thanks! Hi Jen, the first sponge cake I made was the one using 4 eggs for a 8" pan. The original recipe was too sweet, and I cut down the sugar by half. Then I found this recipe using 3 eggs and for a 7" pan. I find this recipe better as 7" cake is just nice for our small family. As I do not have a well trained palatte, I can't really tell the difference between the two, however, I prefer the one using 3 eggs, which has got a better texture and taste better and it is slightly more moist. Thanks for the feedback. Since this is more moist, I will try this recipe first. I will let you know once I've tried it. Cheers! I manage to buy 1Litre of redman whipping cream from PH. But your recipe only uses 300ml. What do you use for the remaining cream ? I dont think we can keep in the fridge again right ? Hi, once the cream is opened, it has to be used up within a couple of days.Otherwuse, you can keep them in clean bottles and store them in the freezer, thaw before using. i'm about to bake my first sponge cake using your recipe. i love the simplicity of it, and the photos are so convincing! i live in the u.s and am unfamiliar with using grams/weight to measure the ingredients. i was wondering if you knew the volume of the ingredients? Hi, just like to let you know that after converting, the measurements may not be as accurate so I hope you can get a scale to measure the ingredient. May I know how do you actually line yout baking try with parchment paper? I tried doing it but my paper tend to crumple and affects the shape of the cake as well! Thanks for any tip you may have. Hi J's Mommy, I lined my cake pan something like this: (http://www.taste.com.au/how+to/articles/889/line+a+round+cake+pan). My cake tin is 20cm and 23cm so if i want to make this cake my cake will be quite short right. So do i need to double it? If i need to double it which cake tin should i use? Hi Janice, actually I won't recommend that you double the portion as the change in ingredient amount may affect the outcome. Maybe you can look for other recipes that suit your cake tin? If not, you may try to double the portion and use your 23cm pan. I hope it will not have any adverse effect on the finished sponge cake. how come sometimes you use salad oil sometimes you use butter? Hi Anonymous, I just follow the recipe according...one of the sponge cake recipe (for 20cm cake) uses oil, whereas this one (18cm) uses melted butter. I personally prefer this sponge cake recipe. I tried making the cake according to this recipe a few days ago and the cake didn't turn out as nice as yours. lol. Actually I tried it twice, the 1st time I have the same problem some people encountered, it was hard and dry. The 2nd time, although it wasn't as hard, it was still dry and crumbles very easily and it hardly burn on the top at all. (it doesn't look soft & fluffy like the picture) I was wondering if you can give me some suggestions or pointers as to what the problem might be. Some modification I made to the recipe are: I used powdered sugar instead of caster sugar ( I couldn't find in the grocery stores, I think in the U.S they called it super fine sugar). In addition, I also cut the baking time to 15-20 minutes because during the 2nd time, I tested the batter during that time and the chopstick came out clean. Any suggestions and comments you can offered would be very much appreciated. : ) Thanks! Hi J.Li, sorry to hear about your unsuccessful attempts. I think the main reason could be the use of the powdered/icing sugar instead of caster sugar. You need to use caster sugar (also known as Superfine sugar) as the size of the sugar crystal affects the amount of air that can be incorporated into the batter during the beating of the sugar and the eggs. The size of the crystal will also affect how quickly the sugar will dissolve in the batter. Since you used powdered sugar, I am not sure whether you were able to beat the eggs and sugar till the batter turns pale, double/triple in volume, thick and leaves a ribbon like trail when you lift up the whisk?? When folding the flour to the egg mixture take care not to deflate the batter. To avoid deflating the batter, you can sieve the flour 3 times before using, and before adding, sieve it over the batter (in 3 separate additions), each time folding in with a spatula. You can look up youtube for demo on how to fold in the flour, or refer to my video clip on "making a cake roll" to get some idea. As for the baking time, every oven works slightly differently, you can always adjust it accordingly. Just make sure you preheat the oven (use an oven thermometer to check) to the right temperature. Position your cake so that it is baked in the middle of the oven. To test whether the cake is done, the cake surface/top should be golden browned, when you press the surface lightly, it should spring back, or a skewer inserted into the centre comes out clean. Hope this helps. Am interested to bake this sponge cake but do not want to use butter. How much oil (ml) is 20g of butter equivalent to? Ame, a rough estimate, you can use around 20~21ml of oil. I tried baking this cake and found it rather tricky to fold in the flour into the batter (even in 3 separate additions). My batter shrank and the cake is really short. Am wondering if I can fold in one portion of the flour first, add melted butter and milk, then fold in the rest of the flour? This may probably make the batter less dry and easier to fold. Hi pandanjuice, I am really not sure whether it will work better this way? You can try sieving the flour a few times before using, and when ready to add, sieve it over the batter, this way the flour will be lighter and easier to fold in. May I check how long can this cake be kept? Reira, I usually finish this type of sponge cakes with cream within 2 days (keep in fridge, covered). Hi, I had tried leaving the cake in the fridge for 1 day but the base of the cake turned out to be very dense and the sponge cake is no longer as fluffy as before. Another issue, the frosting doesn't seem to be even. Some part of the cake can still be seen. It is something to do with the leveling of the cake or not enough whip cream used? I've tried this recipe twice and both times the cake didn't rise, although the second time it did better. I am wondering, is this recipe quantity for 1 layer shown in your picture, or both layers? Hi Stef, I slice this sponge cake into two layers, the same sponge cake can also be sliced into 3 layers. If you have done the above correctly, then it may be due to the folding of the flour. You could have deflated the batter. You can take a look at professional video clips on how to make a sponge cake here (http://www.youtube.com/watch?v=SvzvmpcKi_w) which uses a hand mixer like I do, or (http://www.youtube.com/watch?v=qI-QzZGHYZU) which uses a stand mixer. Hope this helps. Thank you HHB! I did beat the eggs till (slightly) ribbon-stage, so it was probably not billowy enough. I noticed on both occasions that the batter deflated almost immediately after I added the melted butter (which had been cooled). Could this have been the problem? Stef, maybe what you can do after folding in the flour, you can remove some of the batter and place it in another mixing bowl. Add in the butter into this mixing bowl and mix to combine, then add this mixture back the batter. This helps to prevent the batter from deflating too much. hope this helps. the egg mixture DID double in size..but i think i folded the flour wrong...it sank a bit, so i thought EHH NOO...maybe it'll turn out okaay? Hi NomNomSushi, I am sorry, I didnt get to check my blog until this morning. This cake recipe is for a 7" pan, so if your cake may be shorter if you used an 8" pan. You need to beat the eggs and sugar until the ribbon like stage. When folding the flour, remember to sieve the flour at least 3 times before using. When ready to add to the batter, sieve over again, add the flour in 3 separate additions. When adding the oil, do not dump it in, drizzle it all over the batter and fold in. I hope your cake will turn up well today :):) Your mother is very lucky to have a daughter like you! awwh thank you! hope your mother's day went well! What will happen to the cake if i did not add in the vanilla extract and milk? Apparently i forgotten to add them in. I like that your recipe contain less egg. 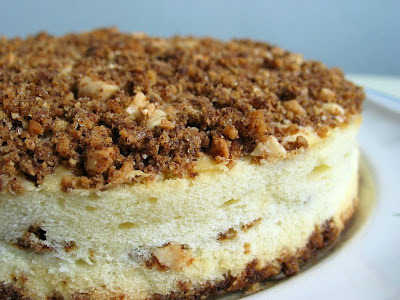 Hi, what's the difference between this sponge cake recipe and this http://happyhomebaking.blogspot.sg/2007/06/peach-layered-sponge-cake.html sponge cake recipe? is there any difference between the texture of the cake? Hi, the texture is about the same, but the peach layered sponge cake is sweeter and it is meant for 20cm(8") pan whereas this is for 18cm(7") pan. Hi, I wanted to watch the demo video but don't know where to click when I am in there, all in Japanese , I don't understand.can help? Hi Goody Egg, I am sorry I think the site has removed the demo video. I am not able to find it too. You can try google translate the recipe link (http://www.choco-recipe.jp/milk/recipe/136.html) to get an idea. Sorry I am of not much help. you are a great blogger friend!! Hi Goody Egg, thanks for reading my blog and thanks for your kind comments :) Love to hear from your more often! Is it possible to double this recipe? Hi, I have not tried doubling the recipe so I am not able to comment. I did this on Christmas Eve for a gathering, the kids love it very much! Hi there, may I know the size of the eggs used? Medium or large? Better yet, do u know the weight of the eggs (with shell or without shell)? Sorry if my questions sound silly. Hi, I use large eggs about 50g without shells.